We have alpaca yarn and other alpaca products available from our alpacas for sale below. Alpaca is highly sought for its fantastic softness, warmth and durability. Have you had a chance to feel alpaca fleece? You will be amazed at how delightfully soft it is. It's a 100% natural product that comes in 22 different colors. Alpaca fleece is shorn from the alpacas once a year (giving them a year to grow another fleece) and processed into a variety of clothing, accessories, and household furnishings. It's fantastic to knit with natural fibers and makes great gifts! 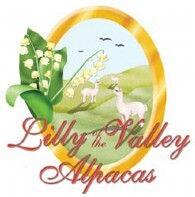 Our online store offers a wide variety of alpaca hats, alpaca clothing, alpaca gloves, scarves and blankets made from alpaca fleece.